Jeremy demonstrating how an e-NABLE hand works. 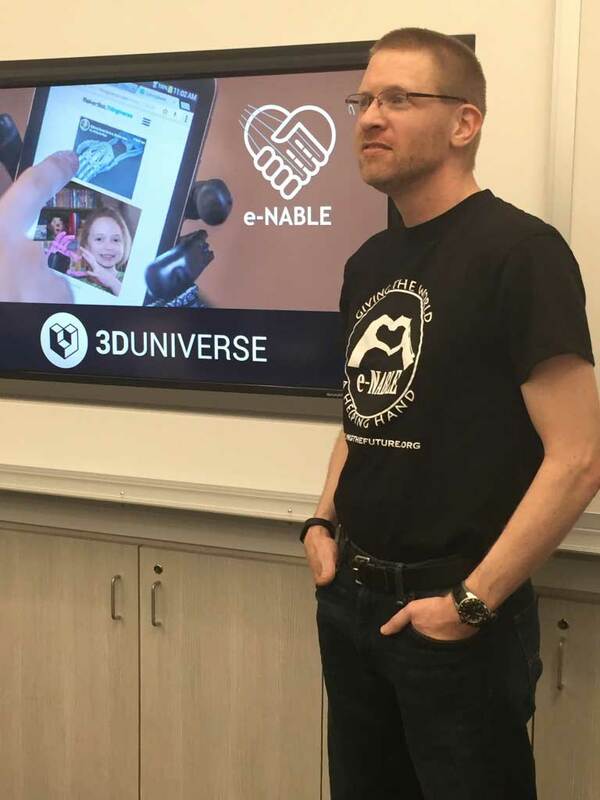 Last week I had an opportunity to listen in on a presentation Jeremy gave at the Barrington Library and I got to learn how 3D printing changes lives. His presentation was part of a “maker” series, focused on 3D printing. It was intended to introduce participants to one very important use for 3D printing: making affordable prosthetic hands. Jeremy was talking about a volunteer organization with which he is deeply involved, e-NABLE, “A Global Network Of Passionate Volunteers Using 3D Printing To Give The World A ‘Helping Hand. '” In two short years, e-NABLE has grown from a handful of volunteers to 4500 volunteers around the world. People are excited about an opportunity to not only learn a new technology but to see how they can be part of helping others in a big way. Jeremy often says that 3D printing is transformative. With what I heard and saw at this presentation, I understood what that means. 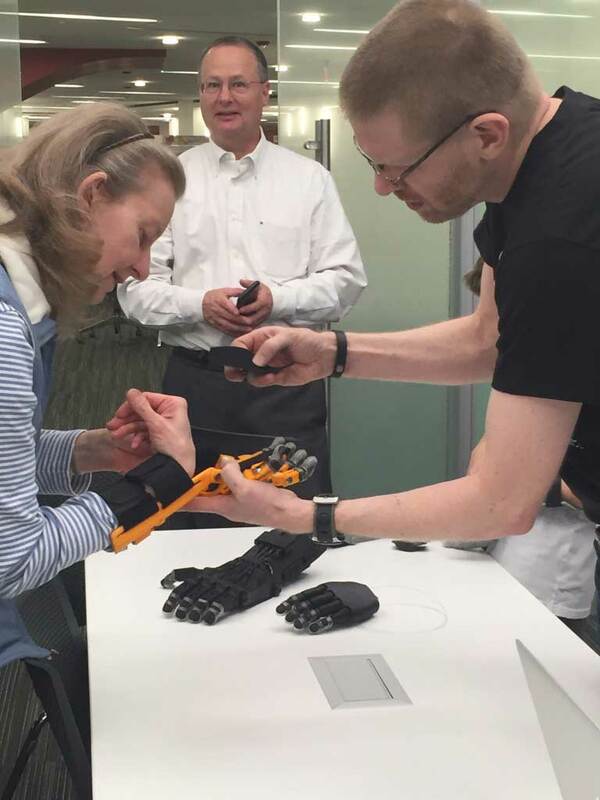 Yes, 3D printing will help those recipients of the prosthetic hands who would not otherwise have them. It will change their lives! It will also change the lives of the “makers” as they are able to reach out to help others in such direct and constructive ways. 3D printing changes lives and will change relationships as well. It will change relationships between makers and recipients, between people across the world involved in a common project, and between individuals and industry. Making prosthetic hands is only one small, although very important, part of what 3D printing can do and will be able to do in our lives. It is exemplary, tho. I am old enough to remember when I first heard of someone purchasing a personal computer. It seemed expensive and . . . well, exotic. I got one myself two or three years later though. I could hardly use it, but I knew there were wonderful possibilities hidden in that metal frame. Still, I couldn’t have imagined then how computers would transform my life. I remembered those early years of personal computers as I watched people listening to Jeremy’s presentation in the library. For forty minutes, there was not a sound in the room as Jeremy showed slides of kids’ smiling faces receiving their 3D printed hands. You could see their new confidence and their changing perception of themselves. It was great to hear stories about kids going from being picked on to being stars in their schools. Jeremy told these stories against the backdrop of a technology that is developing daily and a worldwide volunteer community that is developing right along with it. People’s questions were insightful, far-ranging and rapid-fire, just one sign of the intensity of their interest and excitement. There were technical questions, practical questions, and cultural questions. What’s the best 3D printer? Where do you find parts like the fingertips on the hands (repurposed secretaries’ plastic protective fingertips, included in e-NABLE parts kits)? What is the difference between a hand made for an American kid and a hand made for adults in 3rd world and war-torn areas? I was a latecomer to personal computers. I’m glad I’m not last in line to learn about 3D printing! I can’t wait to see the ways it will change my life. I hope you’ll join me on this adventure. To learn more about e-NABLE click HERE. To learn more about us and the product lines we have to offer click HERE. Learn how to get started with e-NABLE HERE.